A lawn or garden decorated with stylish outdoor furniture adds extra splendor to a patio seating space, transforming your yard into a beautiful place to relax. We all love to spend time outside on patios throughout the year, but with the advent of winter, most of us either abandon our outdoor furnishings or pack up our patio furniture until summer is back. But winter doesn’t need to be a deterrent and in no way an indication to abandon the use of outdoor furniture. It is true that the biting wind of a cold winter may prevent you from relaxing outdoors, but with proper arrangements, your outdoor patio space can be transformed into a cozy place despite the cold weather. Make your winter evenings warm and comfortable by using a patio heater to protect yourself from the cold waves of winter. Patio heaters are easy to install and convenient to use. They can raise the outdoor temperature by up to 25 degrees, transforming your outdoor space into a cozy spot to enjoy the winter with family and friends. Please note, this is not the most ecological solution and frequent use of patio heaters can be a strain on your wallet. The larger size of an outdoor fireplace requires it to be installed in a particular location. Arranging patio furniture around an outdoor fireplaces is nice no matter what climate or season. The added ambiance to your patio makes outdoor lounging a real treat. Add a blanket, a cup of tea, and a book and you are good to go! Fire-pit patio tables are quite en vogue these days. 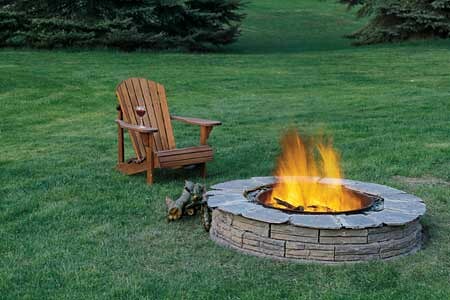 Adding a fire-pit patio table is a great way to warm you up and most of them look fairly stylish too. 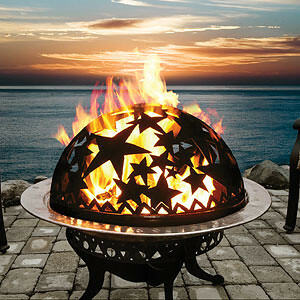 Fire pits are ideal for winter parties and get-togethers, however, the heat coming off of them is limited. Once again, add blankets for your guests and you’ll be fine. Winter winds can reduce the temperature on your patio by 10 degrees or even more, spoiling the cozy outdoor ambiance of your winter patio. Getting wind barriers made of bamboo or other light weight wood enables you to shield yourself from the biting winter wind. Installing patio lighting is a great way to illuminate your patio area in winter when the days are shorter and light becomes scarce. Soft and subtle lighting not only enhances the visual appeal of your patio but also allows you to spend more time on your deck and in your garden. The final and most important factor is to choose the right kind of patio accessories and furniture to enjoy the perfect winter outdoors. Selecting comfortable patio cushions and patio blankets is essential to shield your family and guests from wind chills. When choosing these accessories, make sure that the cushions and blankets are made from water resistant fabric. And remember, fall and winter are both great seasons to find a fantastic patio furniture sale. With all these preparations you can surely enjoy the best our winters have to offer on your own deck or patio and offer your friends and guests a special treatment when the come over for a visit.